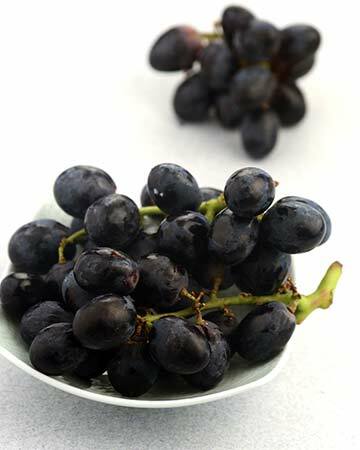 Grapes are small oval or round berries enclosed with a smooth skin and translucent flesh. They are covered by a protective whitish "bloom". They come in three main varieties, namely, Table grapes, Wine grapes and Raisin/ dry grapes. Since there are many varieties of grapes available, it is obvious that they come in variety of colours like green, red, bluish black and purple. In general, grapes have a slightly crunchy texture and a dry, sweet and tart taste. When grapes are dried, they are processed into raisins, currants or sultanas.